LOCATION This three bedroom end of terrace family home, is located in the popular village of Partridge Green, boasting a doctors surgery, vets, Co-op Store, and a selection of other local amenities including a very popular butchers and two public houses, The Partridge and The Green Man. The larger village of Henfield is approximately 4 miles south, offering a wider range of shops, schools and other amenities. The village is also connected to the infamous Downs Link. While the major town of Horsham, offering comprehensive shopping and sporting facilities and main line railway station (London Victoria approximately 55 minutes) is about 8 miles to the north. Convenient road access is close by, leading to major roads including A24, A272 and the A23 with connections to the M23, and Gatwick Airport. PROPERTY The front door opens in to a convenient Porch which offers the ideal space to remove your shoes before stepping in to the house. From here doors open to the Garage, WC and Hall, which in turn has stairs leading to the First Floor and doors taking you through to the Kitchen and Living/Dining Room. The generous Living Area measures 22’11 x 11’1, has space for a both your dining table and sofas and has sliding doors opening to the recently added Conservatory. 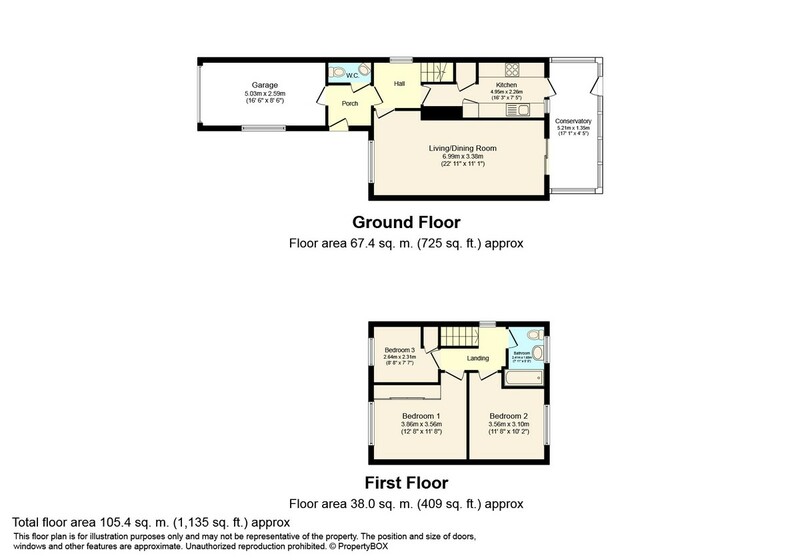 Completing the Ground Floor accommodation is the Kitchen, which has maximum measurements of 16’3 x 7’5, space for a range of appliances and another door opening to the Conservatory. To the First Floor you will find a Family Bathroom with a shower above the bath, and three Bedrooms, with the largest two being generous doubles. OUTSIDE This fine family home is set back from the road with a paved driveway providing off street parking. This is beside an area of lawn that could be converted to offer further parking, and leads to the Single Garage which measures 16’6 x 8’6, has an up & over door, power and lighting. Gated side access takes you through to the well kept Rear Garden, which has a paved patio leading on to an area of lawn which is surrounded by mature borders. There is also a shed in the far corner offering additional storage.